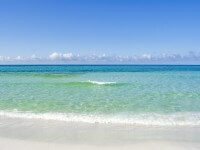 At Hilton Sandestin Beach Golf Resort & Spa, there’s plenty to do for the under-5 set. Consider this top picks list your personal concierge for planning an unforgettable vacation for your family at our resort and nearby. Let your kids do what they do best – play – in the resort’s sand and surf. Our squeaky-clean, bright-white sand and calm, clear Gulf of Mexico waters are safe and pristine for even the youngest beach-goers. Request a beach set-up for chairs, towels and an umbrella so they can have a shady play spot. When you’re ready to swap the beach for the pool, a poolside cabana can provide shade, and maybe even a place for your little ones to nap. Plan a play date in the neighborhood. Families love Silver Sands Premium Outlets, home to 110 designer and name brand outlet stores, as well as to several dining options including Carrabba’s Italian Grill and Panera Bread. If it’s Thursday evening, head to the nearby Village of Baytowne Wharf for “Sunset Cinema.” Arrive by 8 p.m. to spread a blanket on the lawn and watch a family-friendly film. Before the movie, let kids climb and swing on the village’s nautical-themed Adventure Landing Playground. 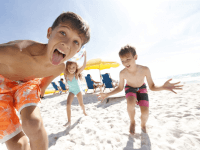 At Hilton Sandestin Beach, you’ll find children’s menus galore at our six distinct dining options. The under-five crowd tends to like Sandcastles Restaurant. After a day like yours, you’ve earned the night off. Contact the resort’s Activities Desk to arrange childcare services so that you and your partner in parenting can enjoy an intimate dinner at our resort’s award-winning Seagar’s Prime Steaks & Seafood restaurant (the area’s only AAA Four-Diamond restaurant), which boasts a 600-label wine list. Then take a moonlit walk on the beach. Don’t forget that our resort offers cribs and pack-and-plays with bedding. Preschoolers might prefer to snuggle up in their own bunk beds, one of the child-friendly amenities offered in our Deluxe Junior Suites.